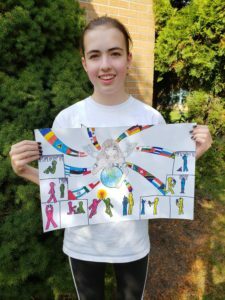 Rye Neck Middle School seventh grader Dylan White has won the Larchmont-Mamaroneck Lions Club?s Peace Poster Contest. In response to this year?s theme, ?Kindness Matters?, she drew a girl holding the earth with doves next to her, flags spiraling around her, and a story of kindness on each side of the page. ?My message is that everyone, the whole world, has to be kind to stay together,? said Dylan. Dylan?s art teacher, Trisha Appel, praised her understanding of the theme and artistic skills ? including realistic details as well as simplified and stylized figures to tell two different stories that show different acts of kindness. ?I think Dylan truly showcased the message that even simple acts of kindness can go a long way for lasting peace in the future,? said Ms. Appel. A total of 71 seventh graders from the middle school submitted artwork for the schoolwide competition. They used a variety of materials ? ?from markers to colored pencils, oil pastels, watercolor paints, and tempera paint ? to express their ideas. 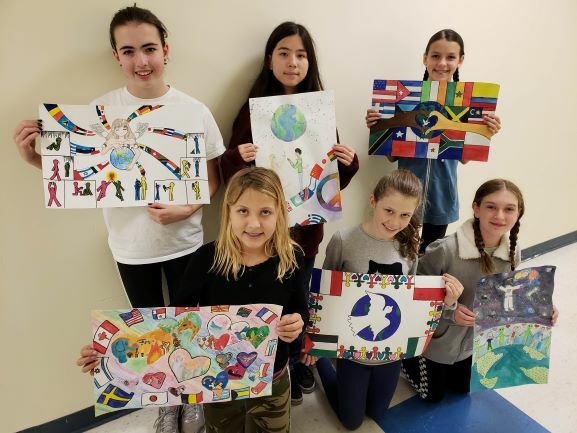 As part of the project, they also discussed what peace means to them, and many of them depicted flags from around the world as ways to express their messages. Blathnaid Grenouillon, Monica Kosakowski, Mana Newman, Megan Ronan, and Sarah Sandberg were finalists. White?s poster will now be submitted to the district-level competition. As part of the contest, students? posters advance through several rounds of competition before an international winner is declared on or before February 1. The Lions Club International Peace Poster Contest has been in existence for? 30 years and provides children with the opportunity to express their creativity and visions of peace.